One of the first methods of second dealing using the Side Push-Off was the second method in Erdnase. It was among the first I ever learned and over the years 1 have found it to be one of the most psychologically deceptive methods in existence. You will note I said psychologically as from a visual standpoint of the "See if you can see it come out" type this one wouldn't rate at the top; however, for a completely disarming method this one can't be beat. It has almost none of the usual tipoffs of a precision squared or beveled pack, the thumb lies at none of the tricky corners or edges but normally and naturally across the deck. Most important of all, the fingers at the side of the deck are not pressed against it as obvious gauges of control but rather are extended, relaxed and move in a normal manner during the deal. Across the table, with the proper attention to angles, plus details, it is in all respects a deal so natural as to be suspect free. Here then is my analysis of the Erdnase 2nd method of second dealing. 1. 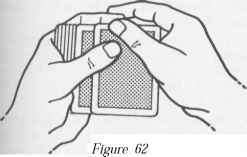 The deck is held loosely in the left hand as shown in Figure 51. 2. Study Figure 51 carefully. Note that the left forefinger is at position 1 but the left thumb is across the center of the deck. The left 2nd, 3rd and 4th fingers are extended and because of this the cards have spread out loosely against these fingers. The pack is in a sort of loose Mechanic's Grip although later actions will put it into a firmer position yet appear quite natural. 3. With the left thumb push over the top card. A few cards may start to move over rather than one; however, the left 3rd fingertip pulls back the excess cards to leave only one projecting. At first it may appear as if the left 2nd fingertip is doing part of this work. It is an aid but the major control is with the left 3rd fingertip. This is only natural as it is the one extending beyond the others, due to the peculiar angle of the deck in the left hand, and thus coming in contact with the pushed off cards before any of the others. 5. The right thumb and second finger take the card. The right forefinger extends across the top right edge of card during the Take. 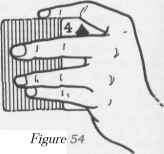 After the top card is removed the left 2nd, 3rd and 4th fingers relax, straightening out in a normal manner, so they are again in position of Figure 51. 7. Assume several cards have been pushed over as seen in Figure 53, a top view, while Figure 54 is a bottom view of the existing condition. You will note the several cards in contact with left 2nd and 3rd fingertips. fers all the cards are pulled back onto eck except the forward two. Figure 55 shows the action from below. 9. As the left 3rd and 2nd fingertips pull back the excess cards, the left thumb pushes forward to assure two cards being over the side of the deck as in Figure 56, a top view. Notice the inward movement of the left fingers when the top card is pushed over the side. This same action is now being used in the Second Deal. It is a slight action in either case and obviously used to keep other cards back as the top one is taken; however, it serves a double purpose during the Second Deal. It also keeps the other cards on top of the deck leaving only two cards resting on the left fingertips as per Figure 57, right side view, where you will note that the two cards are not only resting on the left 2nd and 3rd fingertips but the two cards are also slightly separated from the deck at its outer side just as was the one card. Giving the impression that all of the eck is seen. The underlying principle is similar to that of placing a playing card, across the top of a glass, at eye level to a spectator. They can see all of the glass but not the card. At any rate the right hand takes the second card and deals it to the table. Remember you must not slide the second card out as this will tip-off the deal, you must take it and this is only possible by pulling the top card back and out of the way as explained. 13. After the second card is removed you will note that the original top card remains on the left fingers and separated from rest of the deck, as in Figure 59, but flush with the top of the deck. Note the angle of the thumb as the top card is pulled back. 14. The left thumb pushes over the top card again but only very slightly. At the same time the left 2nd, 3rd and 4th fingertips sort of straighten out to normal as before. Figure 60 shows the left hand at this stage. 15. Press down with the balance of the left thumb in order to engage the second card thus pushing over two cards past the left fingers. It doesn't make any difference if the left thumb starts to push over more than the desired two cards as it is the left 3rd fingertip on the underside that will eventually prevent more than one card going past. Thus two cards will be forward on the left 2nd and 3rd fingertips. The Figure 61 shows two cards pushed forward, one preceding the other, with the rest of deck held in a loose fanned condition. with tacky cards, that several are moved over the left 3rd fingertip, which presses upwards against the edges of the cards, it pulls back what is not needed to leave only two cards forward for the deal. Don't forget to push the cards well forward off the deck as this is part of its deceptive action. I call this the Related Bottom Deal because in action it resembles the natural action of the Side Push-Off Second Deal. Here again it is the complete naturalness of action which is its greatest asset rather than that of a visual deception. 1. 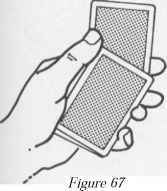 Hold deck in the Loose Grip as per Figure 51 of the Side Push Off Second Deal except the left forefinger is at position 2 at the upper right corner and because of it the deck will not fan or spread out as much; however, the left 2nd, 3rd and 4th fingers remain extended in a relaxed and natural way. 2. With the left thumb across the middle of the deck, push the top card straight off past the left fingers. The right hand comes over to take the top card. The right thumb goes above the left thumb and falls at about center of the card near the upper end at a slight angle. The right 1st and 2nd fingers are extended so that the right forefinger touches the back of of the left forefinger while the 2nd finger goes between the left 1st and 2nd fingers to touch the face of the bottom card at its upper right corner. The right 3rd and 4th fingers are only slightly curled into the palm and they also travel below the extended left fingers. 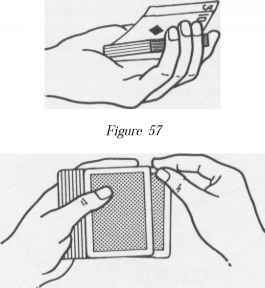 Figure 62 shows the position of both hands at a stage when either the top or bottom card maybe taken. 3. When the top card is taken the left thumb pushes over the next one and so forth as the deal continues. As long as the deal is fair the left hand does nothing but deal in a relaxed manner. 4. When it is required to deal the bottom card a slight and imperceptible change of the left hand takes place. The left forefinger presses inward on the upper right corner of the deck thus forcing the deck's left side into the left thumb crotch. The pack is thus momentarily held under control, between the tip of the left forefinger and crotch of the thumb, just long enough for the right second finger to pull out the bottom card. 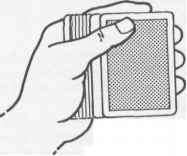 As the right second finger pulls out the bottom card the left 2nd, 3rd and 4th fingers straighten out a bit to allow passage of the bottom card. As these left fingers are almost straight out during the regular deal, the further straightening of them is only for a moment and passes unnoticed. Right thumb, of course, falls onto the card and so it is taken between the right thumb and 2nd finger. 6. As the right second finger contacts the bottom card to remove same, it does so by pressing on the face of the card, then bending the finger in towards the right palm. As the right hand moves away from the deck to deposit the card on the table, the left thumb simultaneously pulls back the top card and immediately advances it over the side of the deck again as the deal continues in a normal manner until another bottom card is required. 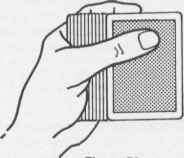 Figure 63 shows a frontal view of the action as the bottom card is pulled out, by the right second finger bending in towards the right palm, while the left thumb is starting to pull back the top card. This is a one hand bottom deal. While it is not original with me the underlying technique is. The original technique consisted of shooting the bottom card out with the left forefinger which I found not only awkward but not conforming to the top card deal. As a matter of fact no satisfactory method of dealing the top card, to conform with the bottom deal had even been used. The procedure was to rapidly deal the bottom cards while retaining the top one rather than dealing tops and only the bottom one when required. My technique consisted of a Block Pushoff, of the top cards, in order to loosen the bottom card which then, by a forward wrist action, was dealt to the table. This technique was originally shown to Dudley Fossum who took it back East where it was kicked around, then several years later shown back to me, as something new by Jerry Styker. This incident led me to devise another method or approach which I called the Inward Deal and showed to Bert Fenn who recorded it in January, 1949. With the years I also devised a technique for dealing the top card that would conform to that of the Bottom Throw Deal. I shall describe the Outward Deal and the Inward Deal as each have just a slight difference in their technical action of the top card deal as well as the bottom deal. This deal can be mastered with a full deck but it is best with half a deck or less. Assume you are using a small packet of cards. 2. Hold the packet in the Mechanic's Grip with the left forefinger curled around the upper end at position 1. The left 2nd, 3rd and 4th fingers are pressing against the right side of the packet, while the left thumb is at the right side of the packet with its tip on the edge of the outer left corner. The position of the left fingers and thumb is shown in Figure 64. Press downward with the left thumb on the left side of the packet and at the same time press downward with the left 2nd, 3rd and 4th fingers on the right side. This causes the packet to buckle over onto the left first finger. Now, simultaneously, move the left forefinger to the left and release downward pressure on the left side by raising the thumb. 3. The above action will automatically separate the bottom card which remains on your palm while the rest of packet is raised by the left thumb as shown in Figure 65. 4. The action in Figure 65 takes place during the deal not prior to it as a get ready. 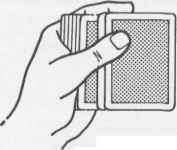 The dealing action is forward which causes the loose card to shoot out at the front of the deck past the left forefinger which is momentarily straightened in order to make way for the bottom card's exit. 5. The deal is started by moving the left hand inward as in the Figure 66. This is a side view to show the relative angle to the body. 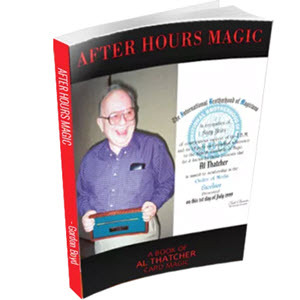 Backs of cards are towards the performer's chest. Also note that at this time the bottom card is being readied for the release. 6. 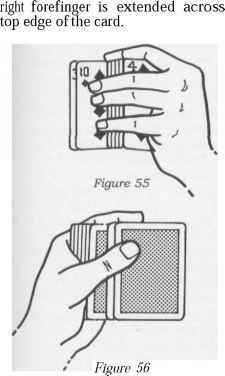 The left hand, in an action almost entirely of the wrist, moves downwards towards the table at the same time the loose card shoots out from front end of deck, past the left forefinger which is straightened at this time, towards the table. The Figure 67 shows the bottom card in the process of coming out the front end of the deck. 7. As the forward wrist action is made the left hand and packet is literally jerked away from the separated bottom card so that the left hand ends up more towards the body at the finish of the Throw Deal. 8. The action so far explains only the bottom deal. Now for the top card deal. Hold the pack in the same position as for the Bottom Deal. 9. As the left hand turns inward the left thumb presses inward on the upper left corner of the top card. This causes the top card to buckle upwards at the front end just enough for the left first fingertip to press in against this curved card. 10. The left thumb maintains its position but the left 2nd, 3rd and 4th fingers move out just enough so that the buckled card will straighten out and remain resting on the tip of left first finger. At this the top card is off the deck at its right side as shown in Figure 68. Its upper right corner is more or less resting on the tip of the left 1st finger and still kept in place by the left thumb at the upper right corner. 11. The left hand now turns downwards, at the wrist, towards the table. At the same time the left thumb releases the top card which slides over the left forefinger and off the front end of the deck in an identical manner to the Bottom Deal. 12. The most important action, that of the left thumb, is identical when dealing the top or bottom card. There is a def :inite inward action of the left thumb during the deal for both the top and bottom card. Do not try to hide this action during the top deal and you will not have to hide it when getting ready to Bottom Deal.